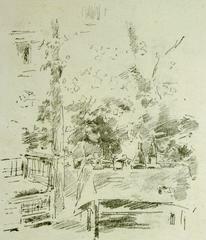 James Abbott McNeill Whistler - Tête-à-Tête in the Garden. A rare trial proof printed in green ink, outside the edition printed in black which appeared in the album L'Oeuvre in 1895 in an edition of 100, all of which were unsigned. 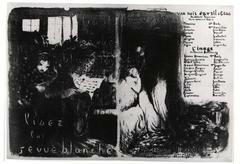 This impression has a signature in the lower left corner " E Vuillard" which may well be the signature of the artist. The Vuillard scholar, Roger-Marx, states in his catalog raisonne, that green impressions are "rare". This impression exhibited at the Museum of Fine Arts, Boston and then at the IBM Galleries, New York in an exhibition entitled "Pleasures of Paradise: Daumier to Picasso", Catalog No. 58 (label verso of backing board). ((Claude Roger-Marx, L'Oeuvre Grave de Vuillard (Monte Carlo: Andre Sauret Editions du Livre, 1948), p. 27)) Provenance: William Kelly Simpson Simpson married John D. Rockefeller Jr.'s granddaughter and was a noted/published Egyptologist at Yale University.